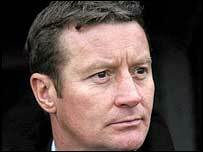 Danny Wilson has been confirmed as the new manager of Milton Keynes with Jimmy Gilligan staying as his assistant. The 44-year-old takes over at the League One strugglers following the departure of Stuart Murdoch last month. Dons chairman Pete Winkelman told the club's website: "This is a very important moment in the evolution of our football club. "I'm sure everyone will be genuinely excited that Danny has chosen to lead the club into our new home at Denbigh."